Pink pillow clouds fill the branches of the dogwood tree in Spring..and how beautiful it is! However...the beauty need not stop there as Nutmeg Hare shares pillow clouds of woolie heaven with "Pink Dogwoods in Bloom" woolen bundle. 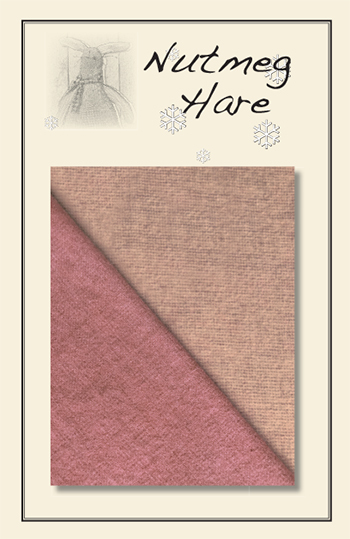 Combining a softly textured wool of peppermint pink with a gorgeous pale pink mauve wool it is beauty at it's best! As always, soaked in a wonderfully scented Eucalan bath and dried to fluffy softness, this wool bundle includes two coordinating pieces in choice of either long sixteenth (approx. 6" x 17"ea.) or fat eight (approx. 12" x 17" ea.) sizes. When my Nutmeg Hare friend was in search of some deep red wool for her new project, the dye pots got busy ...hence it was fitting to call this lovely bundle " Roses for Lisa." 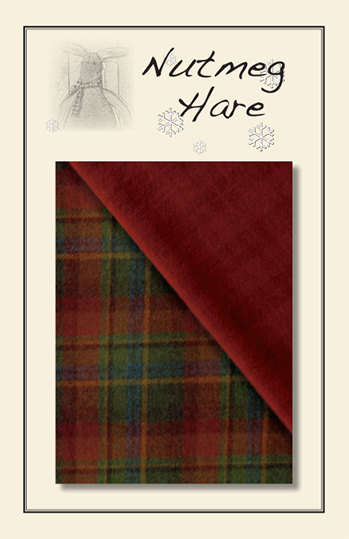 Combining a solid rich red with a deep, luscious red with a plaid design formed with black threads, there are endless woolie possibilities for " Roses for Lisa". As always, soaked in a wonderfully scented Eucalan bath and dried to fluffy softness, this wool bundle includes two coordinating pieces in choice of either long sixteenth (approx. 6" x 17"ea.) or fat eight (approx. 12" x 17" ea.) sizes. 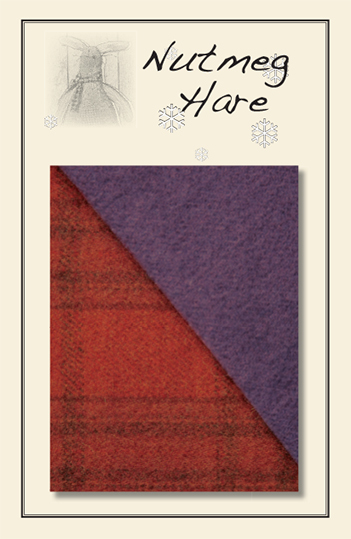 Paint me a picture with wool indeed...Begin with rusty red plaid with a hint of purple striping and add a piece of deep rich purple woolie love and you shall have a masterpiece...stitched, or shall we say "painted" with wool. As always, soaked in a wonderfully scented Eucalan bath and dried to fluffy softness, this wool bundle includes two coordinating pieces in choice of either long sixteenth (approx. 6" x 17"ea.) or fat eight (approx. 12" x 17" ea.) sizes. 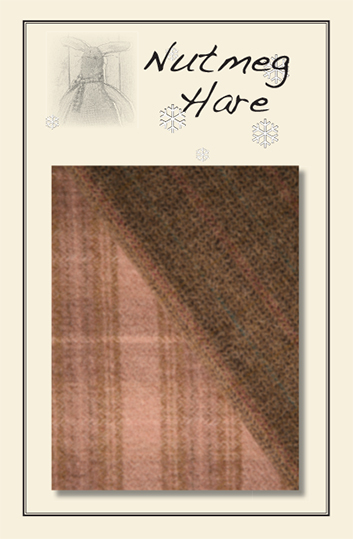 A gorgeous plaid of coral mauve with chestnut overtones wool and a hint of vintage plum is paired with a textured seeded wood highlighting threads of dusty aqua-blue and dark rose. As always, soaked in a wonderfully scented Eucalan bath and dried to fluffy softness, this wool bundle includes two coordinating pieces in choice of either long sixteenth (approx. 6" x 17"ea.) or fat eight (approx. 12" x 17" ea.) sizes. Hand dyed wool...beautiful, soft, and lovely. Nutmeg Hare's newest shades for your wool applique fun are here. Peppermint Patty Pink is like looking into a vintage jar of candy......oh so sweet and sugary! I can't wait to play with this one! 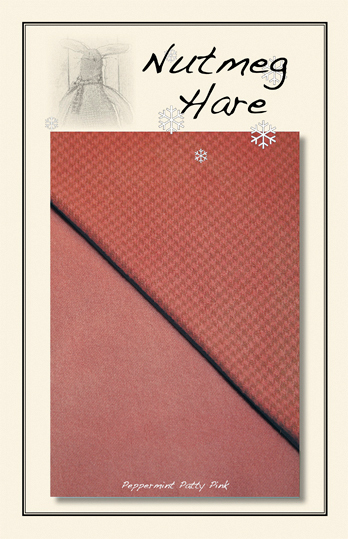 A beautifully coordinated pair over dyed on a houndstooth design and a solid wool piece. Bundle includes two coordinating pieces in choice of either fat sixteenth (approx. 6" x 17"ea.) or fat eight (approx. 12" x 17" ea.) sizes. Bonfires sending sparks on high...velvet moss on tree roots....glorious stars in the dark blue sky...It's a GRAND Nutmeg Hare woolen with a mirage of color. It's the "Best of All' woolie bundle which is paired together with a gorgeous and colorful plaid and a rich and deep red woolen with a muted plaid background of the same shade. You will love this pair. AND... As always, soaked in a wonderfully scented Eucalan bath and dried to fluffy softness, this wool bundle includes two coordinating pieces in choice of either sixteenth size (approx. 6" x 17"ea.) or fat eight (approx. 12" x 17" ea.) size.